Last week I received this cute message from AnimalsTaiwan, after deciding to sponsor one of their dogs, Violet, at the rescue center. (Read more about this sponsorship here). They were kind enough to send me a video of Violet to show me how she’s doing. I've been thinking about her a lot, and my heart broke at the thought that she might not be able to play and do other normal doggy things because of her spine malformation. So I was delighted to see that Violet is still able to play with a ball and move around. I’m planning on visiting her at the shelter soon for some bonding time and to play with her. Because of sponsorships, Violet will be getting a wheelchair, which will make her spine stronger, and overall improve her quality of life. It’s crazy to think that the small amount of money I donate every month can contribute to helping out this little girl in such a big way. If you are inspired by this, how about sponsoring an animal in your city or area? 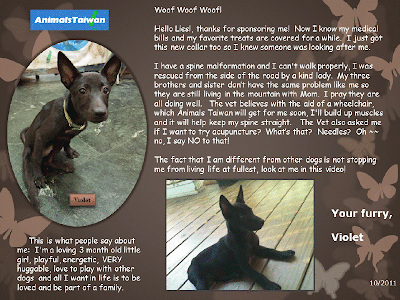 If you want to learn more about the wonderful work they do at AnimalsTaiwan, go visit their blog.